Ha! You probably thought this was going to be about me eating a bite of someone's ice cream or cookie. Wrong! This is about my food. My weighed and measured, accounted for food each day. Yesterday I sat down to my weighed and measured breakfast. My dog came over to stare at me, patiently waiting to see if any would fall to the floor. I looked at the love and hope in his eyes and I gave him some of my breakfast. I did not replace what I gave him with more food for me. Later, while out and about, I was pausing to have a snack and a squirrel came over and sat in front of me, hoping there was something in my hand for him. I broke off a piece and gave it to him. He came back twice more and got two more pieces of my protein bar. I did not use that as an excuse to add some more food into my day. At dinner a few nights ago I looked down at my weighed and measured dinner on the plate and realized (1) I was full, (2) there was still food on the plate. I literally sat there for a few minutes thinking about it. Should I eat it? But I am not hungry now. Should I toss it? But what if I get hungry later and want it: Am I going to try and replace it with something else later, justifying it as making up for what I missed at dinner? I took the brave step and tossed it out. I did not look for anything else to eat all evening. I slept well. I woke up normally without feeling unduly hungry. If you absolutely follow a daily plan and weigh/measure your food, do you ever leave food on the plate? It was new behavior for me. I don't usually NOT finish a meal. I stay within my guidelines - both sides of them. How often do you cross your food guidelines before the lines start to fade? I really struggle with this - when I've measured my food and it's part of my calorie plan for the day, I have a very hard time stopping when I'm satisfied. I have issues of posessiveness when it comes to food! Often I'm able to compromise by wrapping it up and putting it in the fridge for later if I want it, and I then often end up tossing it. I have left food on my plate, but it doesn't happen often because I eat the most minimum amounts. Good for you for not replacing the food you gave away. I would want to replace it, and justify it by thiniking that I did not get my share. There have been a few times lately where there has been some food left and I knew I was really satisfied and didn't want it. I threw it out and didn't regret it for a second. Okay Escape Pod - tell me why I should not feed the squirrels. Do you remember hunting for something in your car with all the garage lights off, and using a flashlight, CSI style? Middle and youngest and I are painting the inside of a dollhouse. It is setting in front of a HUGE window. During the day, sunlight aplenty, I can't see. At night, room lights off, using a high power reading light like a flashlight, I can see perfectly. SO many reasons not to feed the squirrels. People food isn't nutritious enough for them, and can cause serious health problems, it's like junk food for them - very appetizing, and tempts them away from their native food sources. It also causes them to lose their natural fear of people, and they can become aggressive when they don't get food as expected, or can put them at risk by people who don't share the same affection for squirrels that you do. If you must feed them, use a feeder, don't feed by hand, and provide them with foods that are part of their natural diet. I think you said you were going to be very busy, but still checking in on you. Escape Pod: I can limit myself not to feed the squirrels near the house because I do not want them moving into the attic or garage. I do find the Disney squirrels because they are there for life, are already expecting the hand outs and I only give them whole nuts. It is not perfect, but I fed one the day my mother died because it had a V on it's head (my mother's name started with a V) and it sat with me a long time. Great topic! At this point since I'm on a new eating plan and adjusting to fewer calories, I eat everything on my plate. But I'm hoping to get to that place of realizing my hunger and stopping when I'm full. What a novel idea, right? 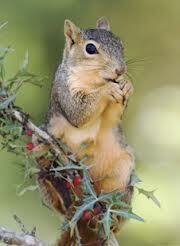 That's such a sweet story, I'd totally give you a free pass on feeding the squirrels!